This article is about the cactus. For the Palm OS software, see Saguaro (Palm OS). For the baseball team, see Surprise Saguaros. The saguaro ( /səˈwɑːroʊ/, Spanish pronunciation: [saˈɣwaɾo]) (Carnegiea gigantea) is an arborescent (tree-like) cactus species in the monotypic genus Carnegiea, which can grow to be over 40 feet (12 m) tall. 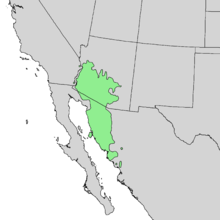 It is native to the Sonoran Desert in Arizona, the Mexican State of Sonora, and the Whipple Mountains and Imperial County areas of California. The saguaro blossom is the state wildflower of Arizona. Its scientific name is given in honor of Andrew Carnegie. In 1994, Saguaro National Park, near Tucson, Arizona, was designated to help protect this species and its habitat. The image of the saguaro is indelibly linked with that of the American Southwest, especially in western films. The common name saguaro came into the English language through the Spanish language, originating in the Mayo language. Some saguaros are cristate or "crested" due to fasciation. The white, waxy flowers appear in April through June, opening well after sunset and closing in mid-afternoon. They continue to produce nectar after sunrise. Flowers are self-incompatible, thus requiring cross-pollination. Large quantities of pollen are required for complete pollination because many ovules are present. This pollen is produced by the extremely numerous stamens, which in one notable case totaled 3,482 in a single flower. A well-pollinated fruit contains several thousand tiny seeds. Saguaros have a redundant pollination system, i.e. full fruit set is possible even if only a fraction of the pollinating species are present. The primary nocturnal pollinator is the lesser long-nosed bat, feeding on the nectar. A number of floral characteristics are geared toward bat pollination: nocturnal opening of the flowers, nocturnal maturation of pollen, very rich nectar, position high above ground, durable blooms that can withstand a bat's weight, and fragrance emitted at night. Further, the amino acids in the pollen appear to help sustain lactation in bats. The ruby red fruits are 2.4 to 3.5 inches (6 to 9 cm) long and ripen in June, each containing around 2,000 seeds, plus sweet, fleshy connective tissue. The fruits are edible and prized by local people. The fruits are often out of reach and are harvested using a pole (often a saguaro rib) 7 to 16 feet (2 to 5 m) long, to the end of which is attached a smaller pole, crosswise. This pole is used to knock the fruits free. The O'odham tribes have a long history of saguaro fruit use. The Tohono O’odham tribes celebrate the beginning of their summer growing season with a ceremony using a fermented drink made from the bright red fruit, to summon rains vital for their crops. Native birds such as Gila woodpeckers, purple martins, house finches, and gilded flickers live inside holes in saguaros. Flickers excavate larger holes higher on the stem. The nest cavity is deep, and the parents and young are entirely hidden from view. 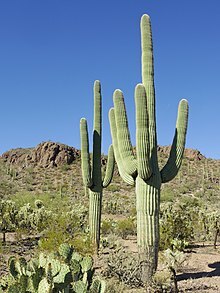 The saguaro creates callus tissue on the wound. When the saguaro dies and its soft flesh rots, the callus remains as a so-called saguaro boot, which was used by natives for storage. The Gila woodpeckers (Melanerpes uropygialis) create new nest holes each season rather than reuse the old ones, leaving convenient nest holes for other birds, such as elf owls, flycatchers, and wrens. In recent years, early-breeding, aggressive, non-native birds have taken over the nests to the detriment of elf owls that breed and nest later. The saguaro is an important source of food and shelter for the Tohono O’odham. Saguaro spines are sometimes used as sewing needles and the ribs are used to make harvesting tools. The ribs of the saguaro were used for construction and other purposes by Native Americans. A fine example can be seen in the roofing of the cloisters of the Mission San Xavier del Bac on the Tohono O'odham lands near Tucson. The Seri people of northwestern Mexico used the plant, which they call mojépe, for a number of purposes. Snow-covered saguaro near Tucson. Saguaros can survive a few hours of below-freezing temperature. ^ "Carnegiea gigantea (Engelm.) Britton & Rose". Tropicos. Missouri Botanical Garden. Retrieved 2014-09-19. ^ a b c d "Saguaro Cactus Fact Sheet". www.desertmuseum.org. Retrieved 2019-03-27. ^ "Life Cycle of the Saguaro" (PDF). Arizona-Sonora Desert Museum. 2008. Retrieved 2013-12-04. ^ "Windstorm Fells 78-Foot Cactus--Tallest in World". Retrieved 2015-08-04. ^ English, N. B.; Dettman, D. L.; Sandquist, D. R.; Williams, D. G. (2007). "Past climate changes and ecophysiological responses recorded in the isotope ratios of saguaro cactus spines". Oecologia. 154 (2): 247. doi: 10.1007/s00442-007-0832-x. ^ Theodore H. Fleming: Sonoran desert columnar cacti and the evolution of generalized pollination systems. In: Ecological Monographs. Band 71, Number 4, 2001, pp. 511–530, JSTOR. ^ SCIENCE Vol. 40 (November 6, 1914) p. 680. ^ Theodore H. Fleming: Sonoran desert columnar cacti and the evolution of generalized pollination systems. In: Ecological Monographs. Band 71, Number 4, 2001, pp. 517–518, JSTOR. ^ "SGP5_Cgig_v1.3 - Genome - Assembly - NCBI". www.ncbi.nlm.nih.gov. Retrieved 24 April 2018. ^ Sanderson, Michael J.; Copetti, Dario; Búrquez, Alberto; Bustamante, Enriquena; Charboneau, Joseph L. M.; Eguiarte, Luis E.; Kumar, Sudhir; Lee, Hyun Oh; Lee, Junki (2015-07-01). "Exceptional reduction of the plastid genome of saguaro cactus (Carnegiea gigantea): Loss of the ndh gene suite and inverted repeat". American Journal of Botany. 102 (7): 1115–1127. doi: 10.3732/ajb.1500184. ISSN 0002-9122. PMID 26199368. ^ a b "Where Saguaros Grow - Saguaro National Park (U.S. National Park Service)". www.nps.gov. Retrieved 24 April 2018. ^ Mark Elbroch; Eleanor Marie Marks; C. Diane Boretos (2001). Bird tracks and sign. Stackpole Books. p. 311. ISBN 0-8117-2696-7. Cavities in saguaro cactuses in the Southwest are common. Both gilded flickers and Gila woodpeckers make these cavities for nesting, but they often choose different locations on the cactus. The stouter bills of the gilded flickers allow them to cut cavities through the wooden ribs near the top of the cactus where the ribs converge. Gila woodpeckers stay at midlevel on the cactus where the ribs are separated enough to cut a cavity between them. Cavities in saguaros are cut out by these birds the year before they are inhabited. The excavated cactus secretes a fluid that hardens into a scab, thus preventing water loss, which could kill the cactus, as well as waterproofing the inside of the next cavity. ^ "Gila woodpecker". Nature Conservancy. Retrieved 2011-01-24. Although they do not use them immediately, waiting first for the sap to harden, Gila woodpeckers excavate cavities in cacti and trees as nesting sites. Females typically lay two broods a year of three to five eggs, which incubate for 14 days. Once abandoned, the cavities are occupied by reptiles, rodents, and small birds like kestrels, elf owls, flycatchers, and wrens. In the desert, the woodpeckers perform the important ecological function of removing unhealthy flesh from the saguaro cactus. Some insects on which it feeds carry diseases, harmless to the bird, which damage the cactus and leave discolorations. The marks signal larvae to the bird, and as it excavates the insects, it also cuts away the diseased tissue. As the sap hardens, the cactus is healed, and the excavation becomes a convenient nesting site. ^ a b Klingaman, Gerald (December 12, 2008), Plant of the Week: Saguaro Cactus, University of Arkansas, archived from the original on April 5, 2013, retrieved 2013-02-13. ^ "Article 11: Arizona Native Plants". Arizona Department of Agriculture. Archived from the original on September 20, 2013. ^ "<unknown>" (PDF). Arizona Department of Agriculture. Archived from the original (PDF) on September 20, 2013. ^ "Arizona Revised Statutes, A.R.S. 3-904. (H): Destruction of protected plants by private landowners; notice; exception". Arizona State Legislature. ^ Trimble, Marshall (2012). "Only On Hold Strange Laws Still On The Books In Arizona". Tucson News Now. Hold. Retrieved July 2, 2017. ^ Inc., General Mills. "Cooking Ideas from Old El Paso". www.oldelpaso.com. Retrieved 24 April 2018. ^ Yep Roc Records (11 March 2015). "Reverend Horton Heat - "Ain't No Saguaro in Texas" (Official Audio)". Retrieved 24 April 2018 – via YouTube. Benson, L. (1981). The Cacti of Arizona. University of Arizona Press. ISBN 0-8165-0509-8. Drezner TD (2005) Saguaro (Carnegiea gigantea, Cactaceae) growth rate over its American range and the link to summer precipitation. Southwest Nat 50:65–68. Wikimedia Commons has media related to Carnegiea. Look up saguaro in Wiktionary, the free dictionary.